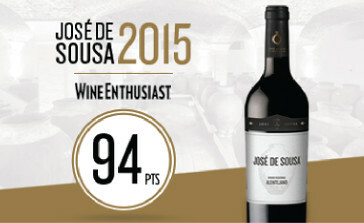 The iconic José de Sousa, was rated 94 points in the latest issue of the prestigious Wine Enthusiast magazine, for its 2015 vintage. The José de Sousa range aims to replicate the historic vintage of 1940, which achieved exceptional quality and was kept in ideal condition under a pile of charcoal for several decades. Having a unique identity and character, the José de Sousa wines are produced using a vinification method that dates back to Roman times – fermentation in clay pots – which adds an earthy character, spiciness and a third dimension to the taste of the wine. According to Roger Voss, wine critic who rates Portuguese wines for Wine Enthusiast, the José de Sousa 2015 is “… impressively rich and structured. It has firm tannins that are balanced by dense black fruits and crisp acidity … it’s a very complete wine”. The editor highlights the ancient method of vinification in clay pots for the blend of Grand Noir, Trincadeira and Aragonez. Roger Voss has consistently rated the José de Sousa with very high marks and has nominated it twice in the TOP 100 Best Wines – vintage 2014 in #5 of this ranking with 93 points and considered “Editor’s Choice” and vintage 2011 in #3 wine in the same ranking. António Maria Soares Franco, member of the 7th generation of the family that leads the company states that “it is with great pride that we see the consistent great scores to the José de Sousa wines, both domestically as well as from the most prestigious International publications- The excellent ratings given by Wine Enthusiast are a great motivation for us and clearly is a sign that our strategy of preserving this ancient vinification method is the correct one”. The vineyards were the grapes of José de Sousa originates, are located in Reguengos de Monsaraz, one of the most renowned sub-appelations of the Alentejo region and home to some of the oldest vines in the area. The soils or granitic origin and with excellent solar exposure, are home to the typical grape varities like the Trincadeira, Aragonez and Antão Vaz and some lesser known like the Grand Noir, Moreto, Manteúdo and Diagalves. Planted over the years by José de Sousa himself, the oldest vineyard dates back to 1950, and the average age is around 30 years old.